Cancer (pronounced /ˈkænsɚ/) is one of the twelve constellations of the zodiac. The name is Latin for crab. Its symbol is (Unicode ♋). Cancer is small and the stars are dim. 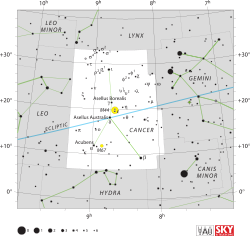 It is between Gemini to the west and Leo to the east, Lynx to the north and Canis Minor and Hydra to the south. Ian Ridpath and Wil Tirion (2007). Stars and Planets Guide, Collins, London. ISBN 978-0007251209. Princeton University Press, Princeton. ISBN 978-0-691-13556-4. Wikimedia Commons has media related to Cancer (constellation).